Ahhh!!! May is almost over, which means it’s nearly time for my biggest cons of the year: Dallas Fan Expo and A-Kon! Prepping for these cons has kept me very busy this month. I’m finished! This wasn’t a particularly time-consuming costume. The cape was definitely the most difficult part. 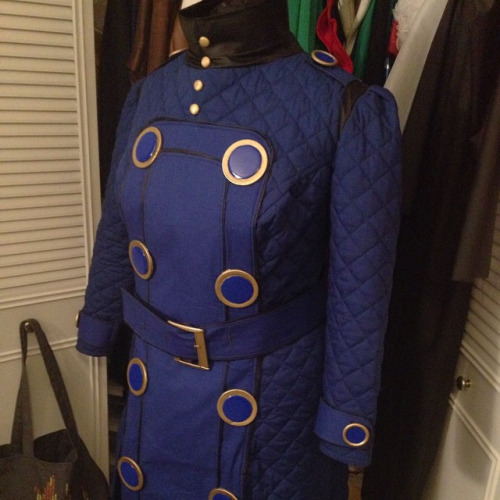 I used almost 12 yards of fabric, and it’s almost 350″ in circumference. I love it! I’ve never made a cape this big before, so it was definitely a learning experience. I’d love to incorporate more cape costumes in my future line-ups. I’ll post a full-write-up on this costume next week! This was my big project for the month. A few months ago, some of my friends asked if I’d join them for a Velvet Room group at A-Kon. When they asked, I had just finished playing Persona 4 and was trying to figure out which character to cosplay, so I jumped at the chance. As of this writing, I’m done with all the base pieces for the costume and finishing up my props. Hopefully they’ll be done in time! I’ll post a full write-up after A-Kon. Lulu is still slow-going since I’ve been so focused on A-Kon and Fan Expo prep. After some thought, I decided to bump her back to a late fall/early winter convention. I was recently offered a chance to collaborate on a really fun project (I’ll announce details later this summer), but it will cut severely into my solo craft time. I’m ultimately grateful for this decision, since Lulu will be my biggest build to date and I have no desire to rush any part of her. I’m still going to be working on various pieces every month, though! I recently decided to re-do the earrings, so I bought a new set of gems. I also picked up a teddy bear pattern to alter for her moogle. I’m hoping to make a hoop skirt base to attach the belts to next month. Commissions: I finished up my friend’s Spoiler commission this month as well. 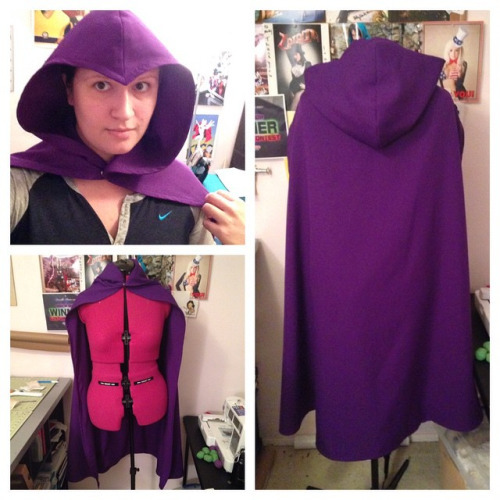 I made her cape from a purple poly poplin. The cape portion is self-drafted (side note: is anyone interested in a general post on cape drafting? ), and I modified the hood based on McCall’s 4139. The whole thing is self-lined and top-stitched along the edges. It’s got snaps at the collarbone, in the back on both sides of the zipper to help distribute the weight, and on top of the spandex mask so that the hood doesn’t slide around on her. I also added twill tape to the inside of the lining to help stabilize the neckline. I’m also working on a few other commissions right now, so there are a lot of mock-ups and pattern drafts littering my craft room, but nothing worth showing right now. Next month! And here’s what I’m most excited about: clutches! 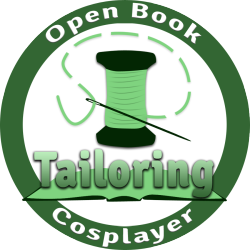 I’ve been toying with opening an online storefront for months, but never got around to it. After finishing all my costume “to-dos” this month, I started cutting materials for a series of geeky clutches and pillows to put up as an initial test-run. I’m hoping to get everything finished up shortly after A-Kon! I’ll also put up some of my old costumes and wigs. 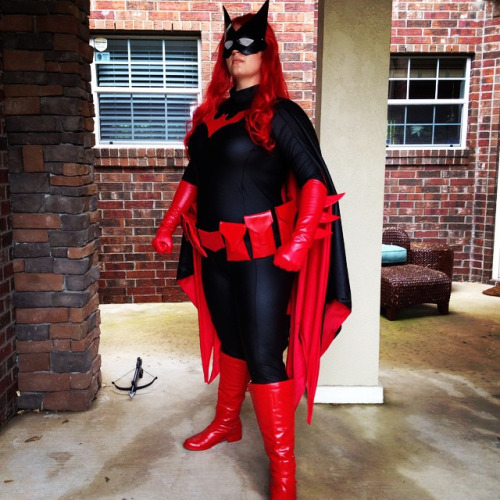 That Batwoman looks amazing! Can’t wait to hear how Dallas Fan Expo goes! Batwoman looks great! A tutorial on capes sounds good to. I’ve sewn a few, but am always interested in hearing how others do it. Thanks, Kara! 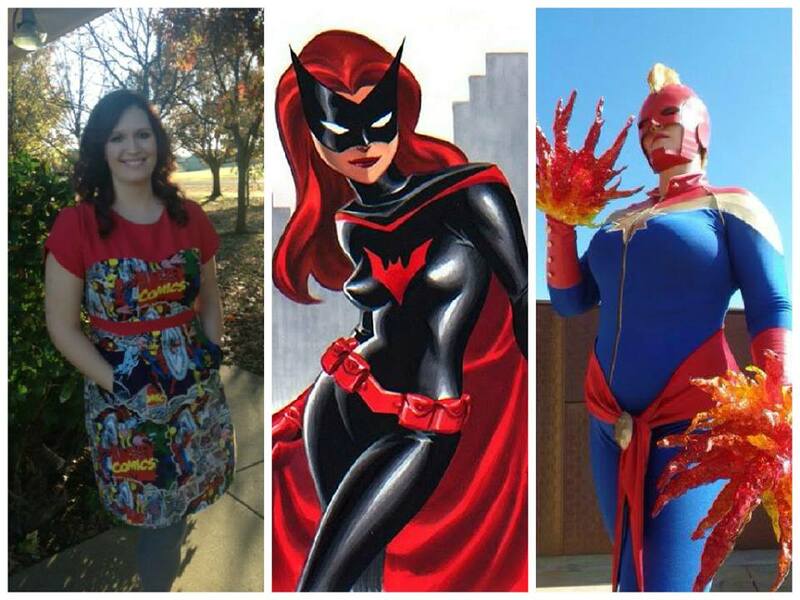 I’ll definitely do a write up on capes sometime after A-Kon.